Eid-ul-Adha was never complete without Kaliji bhuna and parathas in the next morning of Eid !! Ahhhhh !!! After coming to USA , I started my culinary journey alone . Mom is not there , Aunts are not there , none , whom I can ask for “Garma garam ” / just fried parathas and liver bhuna . Everytime I tried making them , they became so hard , hard as a rubber , tasteless and tough . I didn’t know , what could be the problem . I tried every single tips my Mom gave ; don’t cook too much , don’t add salt before . But still then !!! I gave up thinking may be only few can cook kaliji perfect , unfortunately I’m not one of them !! Well , until I came across some of my Pakistani neighbors and I realized the mistake . Yes I do wash kaliji in boiling water which is a complete no no. 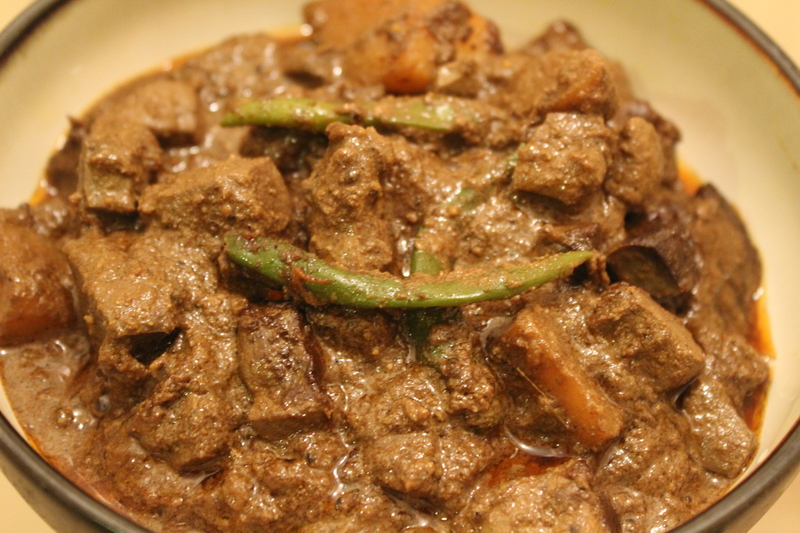 The moment I found out the mistakes I made ,till then , I love cooking kaliji/ liver . Instead of being upset , now everytime I cook them ,I always feel like , I am really one of those luckiest people who can cook kaliji properly !! 😀 Yahoooooo !!! Before I share the recipe , I would like to share some tips . Many , just like the old me , “the unhappy , total failure kaliji cook” ,complain that their lever bhuna gets tight, smelly and rubbery !!! here you go with some tips , if you follow , you will never go wrong !! 1. Don’t try to wash the lever with hot water . We don’t need hot water to let the blood and impurities inside the lever come out . Just use regular water . Soak the lever in regular , normal temperature water with salt and little vinegar for minimum half n hour . Change the water . Repeat the process 3 times . No need to use vinegar these times . Soak the lever in water only . You will see the color of the lever changed and there is no more red , bloody water . Soak the lever in milk for another half n hour . Wash with water. This process would help the lever not to smell bad and to be cleaned properly . 2. Don’t over cook the lever , that would make it tight and rubbery . Maximum 15 -20 minutes . The time may vary depending on the stove and the power . The easiest way to know the kaliji is done , is to poke a toothpick , if it comes clean and without hassle , it is done . So don’t use lots of water to cook the lever. 3. Don’t add salt before you finish cooking . Add salt at the end of the cooking . If you add salt before , the lever will get tight and at the same time no spice is going to get inside it as salt tends to lock the flavor . Just add salt at the end and enjoy flavorful kaliji bhuna . 4. Another important point , many says that the kaliji looks so dark . The reason behind is kaliji gets darker with time . The fresh liver or kaliji will look less dark than the days old liver . So try to cook the liver immediately . 5. If you can manage do the cleaning process without cutting the liver in pieces . Just but the whole , intact liver than wash as mentioned above . Then cut in pieces . It helps to prevent the liver to get darker ,at the same time removes bad smell from it . Grind them together in fine powder . 1. Take little kaliji masala and rub on the kaliji , that would help to remove the bad smell too . 2.Heat oil and add the whole garam masalas- cardamoms , cinnamon and bay leaf . Add the sliced onion and fry until golden brown . Now add ginger paste , garlic paste . Add little water . Now Add chili powder , turmeric powder , pounded garlic and cook . Cook the masalas well until the raw flavor is gone . Careful , don’t burn the masala , or don’t burn the onions or make it too dark , resulting in dark kaliji bhuna . 3. When the masalas are cooked well , add the kalijis/ liver and cook them on medium flame . Add water little by little and cook until the kalijis are almost done and the water inside it dries out . Now add little water and cook until the desired consistency comes . Just little before of turning off the stove , 5 minutes earlier, add salt and whole green chilies . Don’t add salt at the very begining of cooking , that would make the kaliji hard too . Add the kaliji masala at the end of the cooking , turn off the stove and keep the kaliji pot on the warm stove with lid on until the oil separates . 1. many loves cubed potatoes with kaliji bhuna . You can add the potatoes just before adding the kalijis . 2. Sometimes we cook the kidneys , lungs along with liver . Remember , kidney( gurda) , Lungs (phepsa) takes more time to cook than the kaliji . So When cooking together . Add the gurda and phepsa before kaliji and when those are half done , add the kaliji . ১.কলিজি হালকা কুসুম গরম পানিতে আধাঘন্টার জন্য ভিজিয়ে রাখুন. পানি পরিবর্তন করে আরও আধাঘন্টা ভিজিয়ে রাখুন.প্রথমবার পানিতে অল্প ভিনেগার মেশাতে পারেন. শেষ বার দুধে আধাঘন্টা ভিজিয়ে ভাল করে ধুয়ে নিন. এতে কলিজা দিয়ে কোন গন্ধ আসবে না. ২.তেল গরম করে আস্ত গরম মশলা দিন.স্লাইস করা পিয়াজ দিয়ে বাদামী করে ভেজে একে একে ছ্যাচা রশুন, পিয়াজ বাটা, আদা বাটা,রশুন বাটা দিয়ে ভাজুন.অল্প পানি যোগ করে হলুদ আর মরিচের গুড়া দিয়ে ভালো করে কষান. কলিজা দিন.অল্প অল্প পানি দিয়ে কষান.অল্প পানি দিয়ে ঢেকে দিন. ৩.কলিজা বেশিক্ষন রান্না করলে শক্ত হয়ে যায়. ২০ মিনিটের মধ্যে সিদ্ধ হয়ে যাবে. এই সময় লবন আর আস্ত কাচামরিচ দিয়ে আরেকটু রান্না করে চুলা বন্ধ করে দিন. তেল উপরে উঠে আসলে স্পেশাল মশলার গুড়া দিয়ে নামিয়ে পরিবেশন করুন. কলিজা ,গুর্দা রান্নার সময় প্রথমেই লবন দিবেন না.তাতে কলিজা শক্ত হয়ে যাবে. apu methi,kali jheera ar shukra morich ta kokhon add korbo? The kalija dry rub spice mix is what kicks it up a notch. Thank you.